Answer: The ratio of height of image to the height of an object is known as magnification of an image and is denoted as m.
The +ve value of magnification represents virtual image of an object. 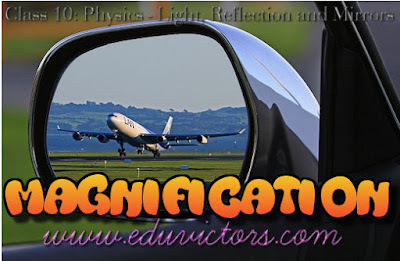 The -ve value of magnification represents real image of an object. Q: Using magnification formula, prove that image formed by a plane mirror is at the same distance as object but behind the mirror. It is given that in plane mirror, object height and image height are equal. ∴ image formed by a plane mirror is at the same distance as object but behind the mirror. Q: The magnification of a mirror is -2. Height of the object is 15cm. What is the height of the image? What type of image will it be? Answer: Given m = -2, h = 15cm, h' = ? It forms real inverted and enlarged image.